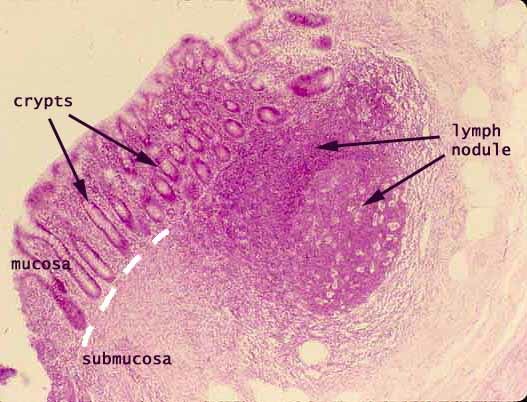 The mucosa of the appendix, like that of the colon, is characterized by straight crypts with no villi. However, unlike the colon, the appendix is also characterized by an abundance of lymphoid tissue, including numerous well-organized lymph nodules. The lymphoid accumulations tend to obliterate the muscularis mucosae and extend into the submucosa. Although normal for appendix, such an appearance might suggest chronic inflammation in some other region of the tract. In acute appendicitis, heavy leukocyte infiltration occurs throughout the wall of the organ. For images, see WebPath (low power), WebPath (low power), and WebPath (low power), or Milikowski & Berman's Color Atlas of Basic Histopathology, pp. 274-275.